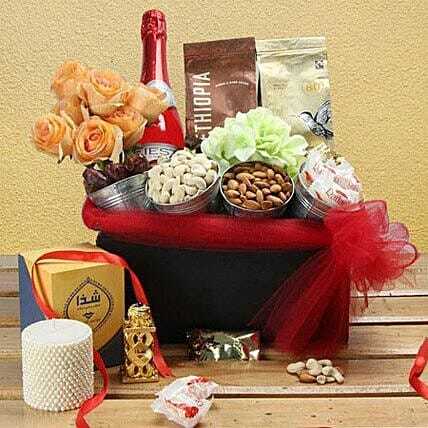 If you are looking for perfect Ramadan gift, try this luxury gift hamper filled with sweet treats. It comprises of dry fruits in metal containers, chocolates, a bottle of sparkling juice, varieties of coffee, pearl studded candle, a small bottle of itar and bunch of orange roses arranged decoratively in a metal container. Exquisite and delicious, this delectably delicious hamper is sure to amaze your dear ones this festive season.